Argentina are out of the automatic qualification places for the World Cup after losing 2-0 to Bolivia hours after captain Lionel Messi was given a four-match ban for abusing an official. Messi was punished for using "insulting words" towards an assistant referee during Thursday's 1-0 win over Chile. Juan Carlos Arce and Marcelo Martins scored for Bolivia, while Everton defender Ramiro Funes Mori was taken off on a stretcher for Argentina. Argentina are now in fifth place. Messi will also miss three of Argentina's remaining four games against Brazil, Uruguay and Venezuela later this year, though Argentina plan to appeal against the severity of his ban. Only the top four teams in South America will qualify automatically for the World Cup in Russia next summer, with the team in fifth facing the winners of the Oceania group in a two-legged play-off. Colombia are now second behind now qualified Brazil as they beat Ecuador 2-0 with goals from James Rodriguez and Juan Cuadrado. 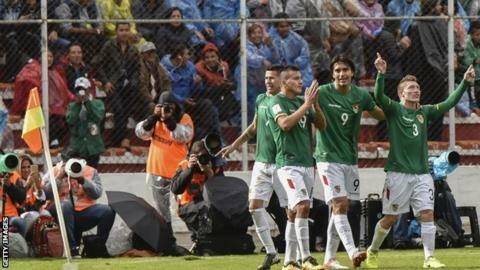 "Bolivia won fair and square," Argentina coach Edgardo Bauza said. "We are still alive and we want to qualify for the World Cup. We know that this is going to be a battle and we are going to keep fighting." Funes Mori was taken off with a knee injury just four days after Everton team-mate Seamus Coleman broke his leg playing for the Republic of Ireland.